A retrospective cohort study, also called a historic cohort study, is a longitudinal cohort study used in medical and psychological research. A cohort of individuals that share a common exposure factor is compared with another group of equivalent individuals not exposed to that factor, to determine the factor's influence on the incidence of a condition such as disease or death. Retrospective cohort studies have existed for approximately as long as prospective cohort studies. This is fundamentally the same methodology as for a prospective cohort study, except that the retrospective study is performed post-hoc, looking back. The prospective study looks forward, enrolling patients unaffected by the outcome and observing them to see whether the outcome has occurred. However, both kinds of cohort studies share the same starting point (considering data from before the occurrence of the outcome). The first objective is still to establish two groups - exposed versus non-exposed - which are then assessed retrospectively to establish the most likely temporal sequence of events leading to the current disease state in both the exposed and unexposed groups. Retrospective cohort studies require particular caution because errors due to confounding and bias are more common than in prospective studies. They are conducted on a smaller scale. They typically require less time to complete. They are better for analyzing multiple outcomes. In a medical context, they can potentially address rare diseases, which would necessitate extremely large cohorts in prospective studies. Retrospective studies are especially helpful in addressing diseases of low incidence, since affected people have already been identified so . The fact that retrospective studies are generally less expensive than prospective studies may be another key benefit. Additionally, it has essentially all the benefits of a cohort study. Some key statistics cannot be measured, and significant biases may affect the selection of controls. Researchers cannot control exposure or outcome assessment, and instead must rely on others for accurate recordkeeping. When relying on individual recall of former exposure to risk variables, recall may be inaccurate and subject to biases. It can be very difficult to make accurate comparisons between the exposed and the non-exposed. 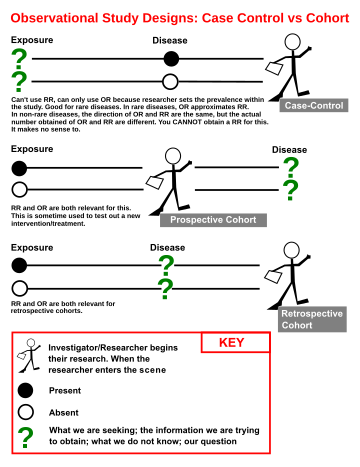 The retrospective aspect may introduce selection bias and mis-classification or information bias. With retrospective studies, the temporal relationship is frequently difficult to assess. Retrospective studies may need very large sample sizes for rare outcomes. While retrospective cohort studies try to compare the risk of developing a disease to some already known exposure factors, a case-control study will try to determine the possible exposure factors after a known disease incidence. Both the relative risk and odds ratio are relevant in retrospective cohort studies, but only the odds ratio can be used in case-control studies. Although most case-control studies are retrospective, they can also be prospective when the researcher still enrolls participants based on the occurrence of a disease as new cases occur. ^ "Definition of historic cohort study - NCI Dictionary of Cancer Terms". ^ a b c Mann, C J (1 January 2003). "Observational research methods. Research design II: cohort, cross sectional, and case-control studies". Emergency Medicine Journal. BMJ Publishing Group Ltd. 20: 54–60. doi:10.1136/emj.20.1.54. PMC 1726024. Retrieved 2 August 2017. ^ a b "Prospective vs. Retrospective Studies". StatsDirect. StatsDirect. Retrieved 2 August 2017. ^ a b c d e f g James, James N. "Retrospective Cohort Study: Strengths and Weaknesses". Tufts Open Courseware. Tufts University. Retrieved 2 August 2017. This page was last edited on 10 January 2019, at 17:42 (UTC).